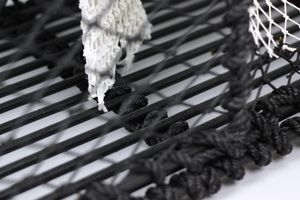 Crab creel mostly for commercial fishing. 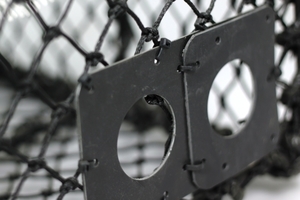 The frame is made of 8mm hot dip galvanized and plastic coated sturdy steel wire. 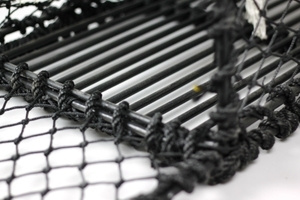 Its got 3,5 black braided black netting and is fully roped to make it more durable. The one and only hatch is located on one of the short sides of the creel and can be shut tight by fastening the hatch hook. Equiped with two soft crab eyes, a double bait bag and ghost fishing thread, this is a complete crab creel.